Troubleshooting Guide: Common problems, when they happen and what to do? Who do I need to inform once my sale completes? Solicitors or licensed conveyancers can carry out conveyancing work. It is possible to do it yourself but we don’t recommend this. Choose a ‘no move, no fee’ conveyancer – not one that charges by the hour. Avoid large conveyancing factories and conveyancing services recommended by online, hybrid or corporate estate agencies. Typically, conveyancing fees on a standard sale should cost (in total) approx. £600-£1,000. To formally instruct a conveyancer or solicitor, you will receive a Letter of Engagement plus T&C’s confirming the instruction and including details of their charges, including any which are payable in advance of the sale. You do not commit to using a conveyancing service until this letter has been signed and returned. Your conveyancer will need to see copies of a photo driving licence or passport plus proof of your address, such as a mortgage statement or utility bill. Your conveyancer will send you several forms including the Property Information Form (TA6) and the Fittings and Contents form (TA10). The sooner you complete these forms, the better to avoid unnecessary hold ups later down the line. You must be completely honest on these forms, or you could jeopardise the sale, or face being sued for compensation afterwards. If you are not sure about whether you want to leave the cooker or curtains, talk to your conveyancer, but normally they would say ‘leave blank’ or ‘for negotiation’ or even ‘TBC’. You can confirm what to leave when you actually have an offer on the table. If your property is leasehold, you will also be given the Leasehold Information Form (TA7) and need to provide a copy of your lease. You or your legal representative will also need to obtain the Management Information Pack from the freeholder or managing agent. This can take several weeks to arrive so it’s a good idea to request it as early as possible. Send your conveyancer copies of documents mentioned in any of the ‘TA’ property forms you fill in, such as guarantees and warranties for any work and building regulations sign-off for building work. Your conveyancer will send you a list of what is required. If you have a mortgage on your property, inform your lender or broker that you plan to sell and find out how much of the loan is outstanding and whether there is an early redemption penalty to pay. Your outstanding mortgage balance will be paid off on completion of the sale, unless you plan (and can) take the current mortgage with you to the next property – also known as ‘porting your mortgage‘. Once you have received and accepted an offer on your property, your solicitor or conveyancer will use all the information you provided, including the Property Information Form (TA6) and the Fixtures and Fittings form (TA10). This, together with any other information and the price accepted, will be used to draw up a draft contract to send to the buyer for approval. Fixtures and fittings included in the sale price. Price of any other fixtures and fittings available separately. Covenants, warranties, guarantees, building control certificates and planning permission. It may also include a provisional date of completion (usually two weeks after exchange, but this is not fixed). The buyer will book a valuer and/or a surveyor to examine your home. This may flag up issues, which they wish to discuss or investigate further. If the survey flags up expensive work that is required – such as a damp proof course or roof repairs – the buyer may want to renegotiate the price to reflect this. Or they may ask you to carry out the repairs before they will exchange. As well as issues which arise from the survey, the buyer’s solicitor or conveyancer may come back to you with further questions relating to the property searches – such as planning, drainage and environmental issues such as flooding – and the buyer may have their own questions, which aren’t already answered in the Property Information Form. When the buyer and their legal representative are happy with the information your solicitor or conveyancer has provided, they will be sent the contract to read and sign. A completion date will be agreed to suit both parties. Up until contracts are exchanged, either party may pull out without penalty. Between exchange and completion your buyer can still pull out but you can sue them and may be able to keep the deposit. The formal exchange of contracts usually takes place via a recorded telephone call between the two legal representatives working for the buyer and vendor. This can only take place when everybody in the chain is ready to proceed, unless someone is able to chain break such as rent, or move in with family or friends. Once contracts have been exchanged, your legal company will receive the agreed buyer’s deposit. Be aware that the contract is now legally binding and you may not accept any further offers as, if you pull out now, the buyer may sue you for their legal costs. Similarly, if the buyer pulls out now, you may get to keep the deposit and sue them for your legal costs. Once you have exchanged, you now have until the completion date to organise removals, pack up your belongings and inform everybody of your move. This period is usually two weeks, although you can request a shorter or longer period if required and if everybody in the chain will agree. It is a good idea to go around your property before you complete to check the contents against the fixtures and fittings form. If you take something you shouldn’t or leave things behind you should have taken, this can complicate and add stress to the day. Ideally, your solicitor or conveyancer will have received the balance payment for the property from your buyer’s conveyancer the day before completion. Transfer the legal documents proving ownership to the buyer’s conveyancer. Organise the redemption of your mortgage and draw down any other monies. Confirm the completion has taken place. Pay any estate agent fees and conveyancer’s fees out of the proceeds. Send a completion statement including all the monies and ask you to pay any outstanding amounts owed. Once completion has taken place, the property no longer belongs to you, so you must make sure you have vacated by this point and handed over the keys to your estate agent, leaving any spare sets inside the property. Typically, you should be out of your existing home by 1pm. This means in reality, most of your belongings need to be packed up the day before, unless you only have a small flat or few belongings. Having a list of all the contacts you need: broker/lender; legal company; agent; removal firm. Making sure you have signed all paperwork and returned it by hand, or by next day signed-for delivery. Having keys ready and labelled to leave and leaving them with the agent for the vendor to pick up – you don’t want them hassling you to get into your home if you haven’t completed. Arranging for completion to take place on a day other than Friday, to give you time to iron out any problems if they arise, rather than having to wait until Monday. Somewhere to stay overnight if for any reason you can’t move into your new home. Taking a picture of the gas, electricity and water meters or having them read just beforehand. Make sure pets and kids are with someone else on the day – it is too stressful for them (and you) to look after them and move at the same time. Having your belongings packed up ready to go a few days beforehand, so you don’t have to rush around on the day before, or if you can move out beforehand. Keeping cleaning stuff ready for your old and new home or, getting cleaners in. Checking that your legal company has received the balance payment from the buyer on the day before completion. What is the sale completion statement? This document, prepared by your legal representative, details all the financial transactions relating to the sale of your property (e.g. money due to the estate agent) and the amount you are due to agent on your behalf, but do check this. What do you do if you think you’ve been overcharged? If you think you have been overcharged, in the first instance contact your legal representative to check. It is possible that you are mistaken and have forgotten about a charge that has been made. If you still believe the bill is incorrect, you should write and confirm what the error is and how you want it resolved. If nothing happens, then follow the legal company’s official complaints procedure, which will be available on request – and, in fact, should have been given to you when you first instructed them. If no resolution is reached through these channels, you may take your complaint to the Legal Ombudsman. When should you instruct your conveyancer? Instruct your conveyancer as soon as you start thinking about selling – Do not wait until after acceptance of an offer! It will speed up your sale. It also helps with your onward purchase because you can focus on the legals for that, without having to scrabble around finding & completing all the paperwork needed for your sale. If a leasehold property, secure the lease if you don’t have a copy available. This can save weeks, if not months. Obtain official copies of your title deeds from the Land Registry. If your property has not been sold for more than 20 years, there may also be paper copies – which may be held by your mortgage lender or solicitor. In doing all this work early it will help identify any potential problems, especially missing essential paperwork, which may need resolving before contracts can be exchanged. 1. Choose conveyancing firm and contact them. 2. Sends you a letter of engagement and terms of business. 3. Check terms of business. 4. Sign and return engagement letter along with proof of ID & address. 6. Inform your lender or broker that you plan to sell your property and find out how much loan is outstanding. 7. Provide details of your current mortgage to your solicitor/conveyancer. 8. Send you forms; TA6, TA10 and TA7 (if leasehold). 9. Complete forms (your legal representative will help, if required) and return them, along with any warranties, planning permission or building regulations sign-offs for any work done on your property. 10. Obtains official copies of your title deeds from the Land Registry. 11. Draws up draft contract using the information you provided on forms TA6 and TA10 (& TA7 if leasehold). 12. Agree provisional exchange and possible completion date. 13. Sends draft contract and legal pack to buyer’s legal representative. 14. Liaise with you to answer enquires from your buyer's conveyancing solicitor. 15. Liaise with you to answer any questions arising from the survey, or from the buyer. 16. Help your solicitor to answer these questions fully. 17. Reviews offer on property if having to renegotiate after the survey. 18. Chase for confirmation that your buyer's mortgage application has been approved. 19. Negotiate a target completion date with all parties & have this written into the contract. 20. Provide input on the completion date negotiation. 21. Receive acknowledgment from your buyer's solicitor that he & his client are happy & ready to proceed. 22. Send you the finalised contract & TR1 form. 23. Check contract, sign and return. Same for the TR1 form but this will need to be witnessed. 24. Secures agreed buyer’s deposit. 25. Formally exchanges contracts, usually over the phone, with the buyer’s conveyancer/solicitor. 26. Have a glass of champagne because you've just EXCHANGED!! 27. You are now legally committed to the sale. 28. Organise removals & cancel building insurance. 29. Confirm with your lender a settlement figure for the redemption of your current mortgage. 31. Sends you the completion statement. 32. Check completion statement to make sure the figures are correct and as expected. 33. Query any anomalies in the completion statement asap. 34(a). Notify people of change of address. 34(b). If also buying on - Contact utility providers to arrange connection and local authority re: council tax for your new home. 35. Requests funds from buyer’s legal representative, to arrive the day before completion. 36. Receive from your buyer's mortgage lender (via the buyer's solicitor) full payment for the purchase of your home. 37. Check your conveyancer is ‘in funds’. 38. Send the title deeds & transfer deed to your buyer's solicitor. 39. Pay himself, your estate agent (unless otherwise agreed) & the redemption settlement owed to your current mortgage lender. 40. Forward any money leftover from the sale to you. 41. Forward the money to your vendor's solicitor (if you are simultaneously buying). 42. Advise completion has taken place, normally around 1pm on the day. 43. Read meters and send details to utilities company. 44. Vacate your property and organise to hand over the keys to the new owners. 45. Have another glass of champagne because you've just COMPLETED!! 46. File all the paperwork – you will need it if there are any queries post the sale. 47. You collect the keys for your new home. 48. Registers you as owners of your new home at H.M. Land Registry. 49. Forward your new title deeds to you or your lender (if you purchased with a loan). For a straightforward sale of a freehold property to a chain-free cash buyer, it can be done in less than 4 weeks. With buyers in a chain &/or requiring mortgages, it’s likely to be 8-12 weeks. However, it can take up to six months or more, depending on a number of factors, including the length of the chain (and if any links break along the way) whether leasehold or freehold and how proactive everyone involved is. More: How long should it take to sell your house? This is usually all done within 24 hours, assuming the legal company has the capacity to deal with new instructions on the day they arrive. If they don’t, it’s worth finding someone else. Fill out the property information and fixtures and fittings forms? This depends on how much work you have done on your property; how long you have lived there and if you have to hand all the warranties, guarantees, building control certificates and planning permissions. To fill in the forms can take a day or two, or longer, especially if you have lost the information and need to request it from the source. This depends on how proactive you and your legal representative are; especially at dealing with the paperwork. The best-case scenario is within a week of receiving an offer, if you have already instructed a solicitor or conveyancer. If not, it could take 4-8 weeks to secure the contract. Get from draft contract to exchange of contracts? 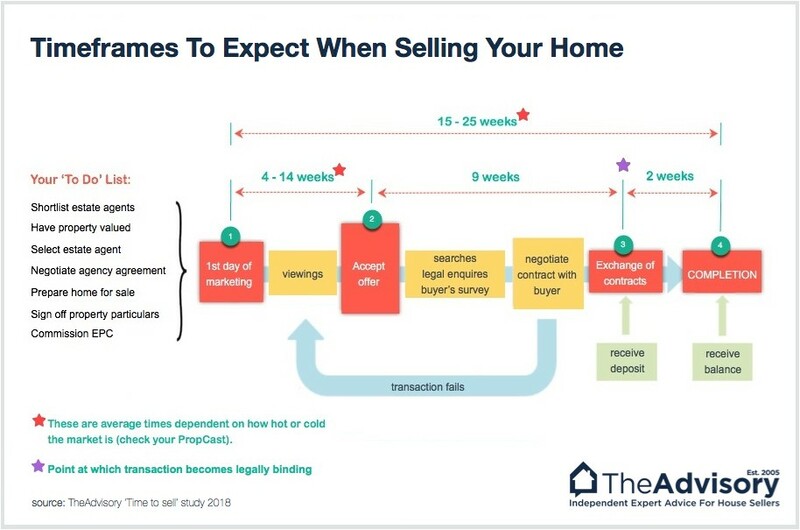 This can be 6-10 weeks but depends on a number of factors, such as how quickly searches are returned to the buyer’s legal company, if the survey uncovers any major problems, the lender can take months to confirm an offer to the buyer and, the more properties in the chain, the more there is to go wrong, so length of the chain can influence this. Additional contract work and the need to work with a third party (the freeholder) can add weeks to the process, too. Get from exchange to completion? This is usually two weeks, but you can ask for more time or a quicker turnaround if you wish but it needs to suit other people in the chain. You will also need to bear in mind how much notice your removal company requires. Why do leasehold sales take longer? Simply, leasehold sales take longer (and the conveyancing will cost more) because of the additional legal paperwork required. The buyer’s legal representative will need to obtain the leasehold agreement from you and, if your flat is in a block which is managed by a company or managing agents, they will need the management information pack. Unfortunately, not all managing companies/agents respond quickly to requests, so this could take several weeks. Some companies charge for this service which might be a few hundred pounds, but they cannot charge an ‘excessive’ amount. 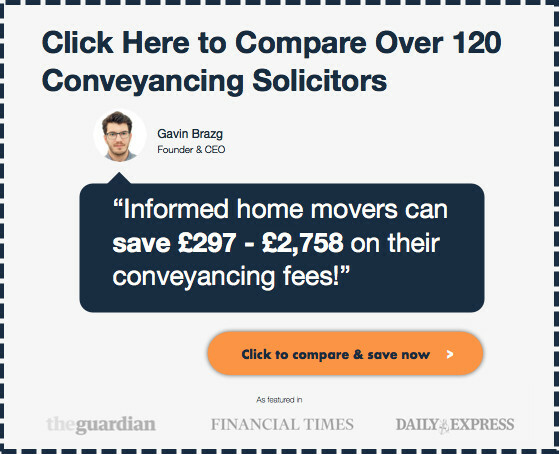 How to speed up conveyancing when selling? Choose a legal company who offers a ‘no sale, no fee’ service as this means it will be in their best interests to keep things moving as quickly as possible. Find out if they use systems which mean you can track progress online so problems can be identified quickly and resolved, if possible. Instruct your conveyancer or solicitor before you accept an offer, so they can prepare much of the information in advance. Get a direct contact number and email address for your legal representative and, if they don’t respond to a question within 48 hours, contact a partner to check you are dealing with the right person. Inform your conveyancer or solicitor of any work you have had done on the property, so they know what paperwork to ask you for. Make sure you have all your paperwork ready, including acceptable ID documents, the EPC, planning permissions and warranties/guarantees for any work carried out on the property, building regulations sign-offs, FENSA certificate for windows installed after April 2002, etc. Keep all paperwork and emails relating to the sale of your property in a dedicated folder, so you can access information instantly, if required. Complete and return any forms required by your conveyancer or solicitor as soon as possible. If scans are not acceptable, deliver by hand or by next day signed-for delivery. Similarly, answer any questions and pay all requests for money immediately. Don’t go on holiday during the selling or buying period as you may be required to provide information or sign documents. If you have to travel – for work, for instance – make sure you can be contacted easily or give your legal company permission to sign documents on your behalf. If you have an interest-only mortgage, make sure you will have enough money to pay off the capital, after all other expenses relating to the sale are taken into account. Discuss timescales with your legal representative so they are aware of your expectations. Before exchange, speak to your legal representative on the phone or in person to sign contracts and iron out any final issues. Make sure you have a named contact and a direct phone number/email address for them. Respond to queries/requests for paperwork/money immediately. Most modern legal companies will have an online tracking system – use this to monitor your sale. Always chase up any queries if you don’t hear back within 24-48 hours. You will be required to complete several forms when selling your home. These provide vital information to the buyer, and must be completed accurately and honestly or you could risk the buyer pulling out or, worse, having to pay them compensation. You may not be able to complete all of this form, but you should provide as much information as you can and state if you don’t know or can’t find the information. You might have to contact a company to obtain a missing guarantee or warranty, or your local authority for a building certificate or planning permission documentation. To fill the TA6 in properly you need to lay your hands on gas and electricity safety certificates, planning consents & building regulation documents, plus warranties for everything from extensions to damp-proofing. This form, which runs to eight pages, allows you to specify exactly what is and is not included in the sale. If you are selling any items separately, you can include these here and specify the price. It includes details of everything from carpets to roof insulation, including kitchen appliances, garden furniture and shrubs, and even taps, light switches and doorbells. If you are selling with a partner, both of you should sign this form. Keep a copy of this form to hand and use it on moving day as an ‘inventory’ of what you can/can’t take with you. If your property is leasehold – a flat or apartment for instance – you will need to complete an additional form about the management of the building. This six-page form asks for contact details for the management company, lease information, and details of buildings insurance, maintenance and service charges. Can I leave some of the protocol forms blank? If there are any questions you genuinely cannot answer, you can state ‘do not know’ on the form. Bear in mind that if it transpires that you did have the information all along, you could be sued for compensation by the buyer, or they could decide to pull out of the purchase. The buyer may have received a mortgage offer several months ago, which has now expired, or they may have received a gift of money and their lender will need to verify its source. All these can cause delays, which are out of your control. The buyer’s legal representative will order several searches, which could take weeks to be returned, depending on the speed of the local authority. Again, you will just have to be patient. If you have not provided a document – such as building regulations sign-off or evidence of planning permission – this can cause delays as the buyer’s conveyancer will not be able to proceed until all information is available to be examined, unless it is possible to insure against this. This can cost a few hundred pounds and it’s likely the buyer’s legal company will ask you to pay for this. It may be worth offering it to help the sale go smoothly rather than spending days or weeks desperately trying to find the paperwork. Within the chain, if a transfer of funds fails or is delayed, this will affect every transaction below it. You can monitor your own fund transfers, but any others are out of your hands. There is a criminal scam at the moment where legal company’s emails are intercepted and account details are changed. NEVER send funds to your legal company’s bank account without verifying by phone the sort code and account number. If the buyer’s legal representative is not proactive, or is away, there is little you can do except have your estate agent suggest to the buyer they change their conveyancer (or risk losing the house). Don’t hesitate to fire them and find another. The cheapest conveyancer is rarely the best. The cheapest is likely to be the busiest, and in turn the most difficult to contact, and quite possibly the slowest. Even if you have been co-operative about granting access for the survey, others in the chain may not be so accommodating, and this can cause delays. If the survey discovers an issue with your property, which you cannot prove has already been fixed or is not a problem, you have to decide whether to reduce the price or get the problem fixed. Ignoring it is not an option, although you may have been honest and upfront about the problem from the start and priced that in when marketing. However, at this time it worth being fair to both yourself and your buyer as you may lose this sale and other buyers’ surveys will no doubt uncover the same issue. In fact, any survey within the chain – not just the one on your property – could throw up problems which need negotiating or resolving before exchange can take place. If you are looking for a new home, this can delay things considerably as you will need to find a property to buy, make an acceptable offer, potentially obtain a mortgage offer, wait for search and survey results etc. Instead, if you can move into rented accommodation or stay with friends/family, this can speed things up. It also gives you the opportunity to wait for the ‘perfect’ property to come along and, if you are moving to a new area, allows you to get a feel for the location before committing to buy. You are selling a property which you have inherited. You are getting divorced so it is not yet fully yours. The title has not been registered with the Land Registry. If this happens, you could find yourself back at square one, so see if you can work with your conveyance and estate agent to find out why the buyer has pulled out and if the issue can be resolved. If the deal is definitely off, you might want to see if you can get a buy to let or let to buy mortgage on your property and rent it out temporarily to enable to you to move on. Once you have exchanged contracts, you may think you are home and dry, but this is not always the case. Money being sent by the buyer’s legal company to yours, for the purchase of your home can be delayed, so always ask for this to be sent the day before completion, and check that it has arrived. If it doesn’t arrive in time, you won’t be able to complete and the move will be delayed. The buyer will also be in breach of contract and may have to pay you interest and a ‘notice to complete’ fee. Anywhere along the chain, a problem may occur – a money transfer may fail or a conveyancer may make an error – which impacts the rest of the chain. Make sure you have completed and returned (by hand or next-day delivery) all documents and check with your legal company that they have everything they need. If you fail to vacate the property on completion day, the buyer is within their rights to request compensation from you to fund any costs, such as removals, storage and hotel fees. If your fixtures and fittings don’t match the form, i.e. if there is something major missing, the buyer is likely to come back to you to request compensation. While some of these claims are genuine, some buyers will try things on and attempt to claim compensation for faulty heating systems etc., even if they were working to the best of your knowledge. If you have been honest on your Fixtures and Fittings form, and not deliberately misled anybody, you have the law on your side thanks to the ‘caveat emptor’ (buyer beware) rules. Your legal company will deal with such issues, so never be tempted to give the buyer your phone number, however friendly they seem. Conveyancing is an area of the law (and process) relating to the legal transfer of property owernership. What is the solicitor’s role? For a vendor, the solicitor’s or conveyancer’s role is largely to provide information to the buyer’s legal representative. 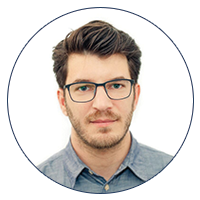 They will also check that the buyer is legitimate, prepare your sales contract, deal with any disputes and manage the money transfers. Conveyancing can be carried out by a licensed conveyancer, or a solicitor. Check that they are a member of the relevant professional body; for conveyancers that is the CLC, while solicitors should be members of The Law Society. There is nothing to stop you doing your own conveyancing unless you are getting a mortgage, in which case they will insist on legal companies being used. However, it is a detailed task which can be complex and time-consuming, so it is not advised, unless you have experience in this field and the sale is very straightforward. Getting a sale wrong can cost you tens of thousands of pounds – or more! It is sensible to choose your solicitor or conveyancer when you first put your property on the market, instead of waiting until you get an offer. This will save time and speed up the sale of your property. You can agree fees and have a company on standby and contracts can be prepared prior to you receiving an offer. What is a memorandum of sale (MOS)? A memorandum of sale is a document recording that both you, the vendor, and the buyer have agreed to the transaction. It will usually include the price agreed, details of both parties and their legal representatives, and any conditions. It does not become legally binding until contracts are exchanged. What is a deed of transfer? The transfer deed (TR1) is a formal document which transfers the property from the vendor to the buyer. Before completion, the deed of transfer needs to be agreed by both parties and then signed by the seller, with an independent witness. You will probably be asked to sign and return this before exchange of contracts. What happens to your mortgage? When you sell your mortgaged home, you will have to pay off the balance of the mortgage – even if the sale of your property doesn’t cover the outstanding amount. If there will be a shortfall, you will need your lender’s permission to sell. They will send you a bill for the shortfall so you will need to make arrangements to pay, although this may be done through your legal company. In most cases, the sale of the property will cover the outstanding mortgage, and your legal representative will transfer the necessary funds to your lender, plus any redemption fee if there is one. Do I have to provide my mortgage redemption figure? Yes, early on in proceedings you will need to inform your lender than you plan to sell, find out how much is outstanding on your mortgage and provide your conveyancer or solicitor with this information. If you give details of your mortgage to your legal company, they will request statements for you. In some cases you might be ‘porting’ i.e. ‘taking with you’ the mortgage from your current to the new property, but even then the mortgage company may ‘close down’ your old loan and create a new one, even with the same terms. Can a solicitor act for both the buyer & the seller? Yes. But it is extremely unusual for a solicitor or conveyancer to act for both parties, due to the potential for a conflict of interest. In its Code of Conduct, published in October 2011, The Solicitors Regulation Authority (SRA) says a conveyancing solicitor can only act for both a buyer and seller in rare circumstances, and both parties must agree. Why do solicitors need my identity documents? To comply with Money Laundering Regulations, your conveyancer/solicitor is required by law to verify your identity and address. If they fail to do this, they may face a penalty or sanction and, in the event of a fraudulent transaction or money laundering, they could be found guilty of an offence. If you are selling a property which has had building work carried out but you no longer have (or never had) building regulations certificates or a guarantee for the work, the buyer’s legal representative may find this problematic, delaying or even jeopardising your sale. In this case, you or the buyer can take out indemnity insurance, which will pay out if it later transpires that the work has not been carried out satisfactorily. You will need to negotiate who pays for this insurance. A word of warning: If anybody approaches the local authority to query a missing building regulation certificate, any indemnity insurance policy may become invalid. Regarding building regulations, the council can only take action against a homeowner about a lack of building regulations sign-off within 12 months of the work being completed, unless it is considered to be a dangerous structure. But an indemnity insurance policy can only be taken out at least 12 months after the work was finished… when it is too late for the council to take action. And if the structure is deemed to be dangerous, this should be picked up in the survey. It is also worth noting that the cost of an indemnity insurance policy is linked to your property’s value, regardless of the size or cost of the work being insured. Typically they cost a few hundred pounds and would be paid for by the seller. I’ve accepted an offer – What happens now? If you have already provided your Fixtures and Fittings form (TA10) and, if leasehold, Leasehold Information form (TA7), and supplied any supporting documents, you should have very little to do yourself, as your legal representative will take care of things. There may be questions from the buyer which need answering, and paperwork (including the contract) to sign, so the main thing is to ensure you are available and respond to all requests as quickly as possible. What needs to happen before I can exchange contracts? Before you can exchange, the buyer and their legal representative both need to be satisfied with the property, based on the results of the survey, any searches and any paperwork you provide. Your conveyancer will draw up a draft contract and submit this, with a legal pack, to the buyer’s legal company. If the buyer needs a mortgage this must have been secured, and will require a valuation/survey. A completion date needs to be negotiated and agreed, and confirmation must be received from the buyer’s legal representative that the buyer is ready to go ahead. Your conveyancer/solicitor will also want to confirm that the buyer has the funds for the purchase. A final contract needs to be drawn up and both parties need to sign. Once all of this has been completed, contracts can be exchanged. How do I decide upon and agree a completion date? You will need to negotiate your completion date with the buyer and, most likely, other people within the chain. It is usually two weeks after exchange, although this is not fixed and you can ask for a longer or shorter period, depending on your individual circumstances. The day of the week can make a big difference, too. Friday is the most popular, so that people have the weekend to settle in, but for that reason it is also the busiest with removal firms, legal companies and estate agents. In addition, if there are delays, you risk not being able to resolve them until Monday. Completing earlier in the week can be less stressful, if you can get everyone to agree. What is a leasehold information pack? The seller will often be charged a fee for this, but it must be reasonable. Additional enquiries are questions raised by the buyer’s conveyancer on their behalf. This is a normal part of the conveyancing process and, while they can be frustrating, the buyer’s legal representative is only doing their job. Questions may be asked about anything, which is not covered in the Property Information Form, or Fixtures and Fittings Form, so ensuring these are completed fully and accurately should help to minimise additional enquiries. Questions may also arise from the survey or searches. Never underestimate the enormity of the task of changing your address with all your correspondents. A good tip is to monitor all your mail as soon as you put your property on the market and keep a note of all the senders. Even then, you can miss infrequent ones such as annual catalogues or charity mailings. For this reason, you may want to use the Royal Mail’s redirection service, which costs £33.99 for a 12-month subscription. Specialist such as dentist, osteopath etc.